...around 60 centimeters in length--bottom-heavy--and its tail adds another 30 centimeters. There is a wound on its stomach. Almost all of its fur is gone apart from a few sparse, brown-colored hairs on its back. Its head looks mostly like that of a dog, but its nostrils are that of a cow, and it has a few short whiskers hanging from its cheeks. It has round ears and folds on the skin on its neck. Its hindlegs are far longer and heavier than its forelegs, and each of its four wide feet has five toes, almost like that of a lion or tiger. Foreign tabloids named Ke's animal the Oriental Yeti--which is both redundant and silly--and the Chinese Chupacabra. One of the foresters who looked at it said it looked like a common badger. My best guess was that it was a binturong. Several other bloggers opined that it was a palm civet. Chen said she thought her animal was a beech marten. The Daying County Forestry Department has finally announced their results. 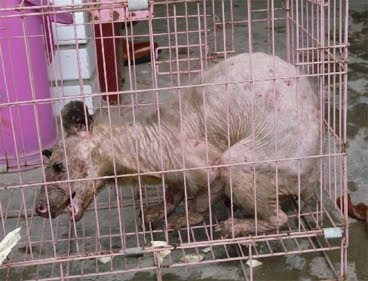 They're calling it a Himalayan weasel with mange. It is the first time one has been reported in Daying County. The suggest that recent reforestation efforts might have drawn it in. Despite the fact that Himalayan weasel's are known chicken thieves, the foresters treated it for its mange and released it back into the forest. The foresters decided Chen's visitor was a masked palm civet and also set it free. Just to keep things confusing, an English language story from Xinhua translated the name for Ke's mystery animal given out by the Daying County Forestry Department as "albino civet cat."